Kimdecent sells some cheap RK3188 mini PCs such as QC802 for $76, but instead of sending me yet another RK3188 device, they agreed to send CS868, an HDMI TV dongle powered by AllWinner A31 quad core processor, so that I could review it. This mini PC comes with 2GB RAM and 16GB Flash, the latter being larger than the 8GB flash found in most other devices, and is available for $95 on Kimdecent Aliexpress store. More details about the specifications are available on Unuiga U28 post since the hardware is the same. In theory, AllWinner A31 has a much slower CPU than Rockchip RK3188, but its PowerVR 544MP2 GPU should outperform the Mali-400 MP4 found it the Rockchip processor, and A31 supports 4K2K video decoding. In this post, I’ll show some unboxing picture, give my first impressions, test Wi-Fi performance, video playback capabilities, and run some benchmarks. I received the device in a parcel with lot of bubble wraps, so the package was not damaged, but there’s not much to say about the package as it’s just a no name “mini PC for Android OS” without specifications, or other useful information. Inside the package, we’ll find CS868 mini-PC with a metallic casing, a short HDMI cable, a 5V/2A power supply, a microUSB to USB cable for power, and microUSB to USB female cable for the microUSB OTG port of the device, and a not-so-useful user’s manual in English and Chinese explaining how to use Android on mini PCs. A closer look at the device reveals a fully metallic casing, HDMI male connector, a micro USB OTG port, a micro SD card slot, another micro USB port for power, and a full USB host port. There are lots of ventilation hole on both side for cooling the device. You can also watch the unboxing video. I’ll keep using the standard Home Screen since I find it a bit more convenient with the input device I use. We have the Volume buttons, and a power button in the status bar, but no option to go to full screen. 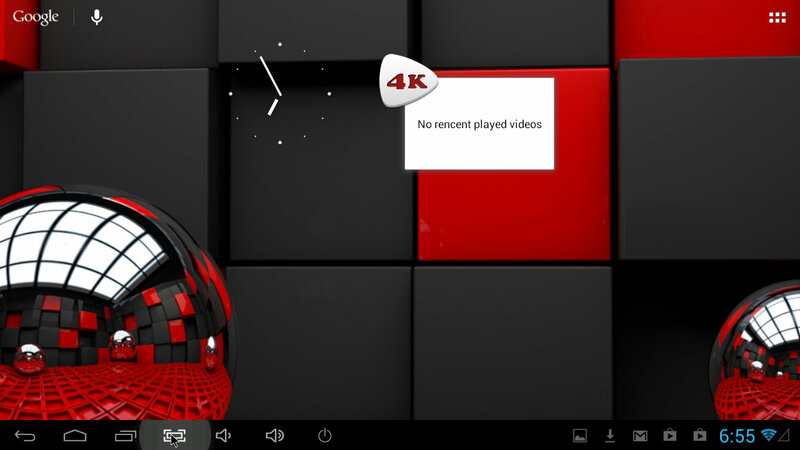 You’ll also notice a 4K widget, which is an interesting media player I’ll describe in more details in the video section. I’ve gone to the setup menu to configure Wi-Fi. The device also supports Wi-Fi direct, but not Bluetooth, nor Ethernet, ven with external USB dongles. You can also setup to device for VPN access, as a hotspot, and add a 3G USB dongle. The screen section lets you select 720p, 1080i, and 1080p modes at either 50 or 60 Hz, and you can also choose 1080p24. A slider is also available to let you zoom in/out to adjust your screen overscan if needed. There’s an option for Audio output, but clicking on it, just exits the Settings, so audio pass-through is not available. Screen Lock option is available in the System Settings, so if you require your device to be lock this should be possible (I haven’t tried). Developer options all seem available including USB debugging, CPU usage, GPU usage and more. In the “About tablet” section, we find out CS868 is indeed the model, and this device runs Android 4.1.1 on top of Linux 3.3.0. The firmware is dated 2013/05/06, it’s rooted, and can be downloaded via Kimdecent website. Google Play worked fine, and I could install most apps I tried such as Antutu, Angry Birds Star Wars, MX Player, YouTube, Dead Trigger, and more. The only exception was Sixaxis Controller, but this is normal behaviour, as the device does not support Bluetooth. The system is pretty responsive, although It does not feel as fast as RK3188 devices, and I can experience slowdowns just after boot, give it one or two minutes to be fully responsive, and while installing many apps via Google Play. The device did not hang during use, but there are still some annoying issues. I lost audio 3 times during my few hours of testing (reboot required), Wi-Fi failed to initialize once (reboot again), and at one point the device was stuck in the boot animation “AllWinner Tech A31 Quad Core” forever. Restarting the device did not help, so I had to flash the firmware via PhoenixUSBPro. As I started to test video playback, and noticed very similar problem to what I experienced with Tronsmart T428, that is 1080p video would just no play smoothly. So I stopped video playback testing, and went straight to my “transfer a file from SAMBA to flash over Wi-Fi” test. The result was catastrophic, as a 278MB file took 7m 46s to transfer, at an average rate of about 600KB/s, by far the worst result I’ve ever seen (Other devices usually take 3 to 4 minutes to transfer this file). Real-time transfer speed shown in ES File Explorer fluctuated greatly but never went over 1MB/s. Two consecutive devices with terrible Wi-Fi performance? Impossible! I remember once I had a USB Wi-Fi dongle that was extremely slow using mixed 802.11b/g/n setting in my router, and the performance improved massively by setting the router to use 802.11g only. So I did that, and the performance improved, but not enough to my taste: 5m 45s (~800KB/s) , and the transfer started very fast at 1.60M/s until 80%, to collapse at the end around 200KB/s. Then I had an unthinkable idea, what if my router (TP-LINK WR940N v1) , or rather its firmware, was the cause of my Wi-Fi misery? Firmware: 3.9.18 Build 100104 Rel.36350n. A Google search quickly directed me to the firmware download page of my router, with a more recent firmware: 3.13.9 Build 120201 Rel.54965n. So it looked like my firmware was just over 2 years older than the latest available version, I downloaded the file, and upgraded it. Let’s try that file transfer test again: 1m 30s, or 3.09MB/s. That’s the fastest speed I’ve ever seen with any of the little devices I tested. Of course, I can’t use that number to compare to other devices without repeating the test for the earlier devices (which I may do), but at least Wi-Fi transfer speed won’t be the limitation for the video playback tests. The moral of the story is that if one of your Android mini PC has poor Wi-Fi performance, don’t start to open the case and try to add an external antenna, check your router has the latest firmware revision first. I’ll have to check the effect this new router firmware has on T428 as well. I’ve installed MX Player for this purpose, and made sure the hardware decoder is used, or mention it if software decode is used instead. I’ve also played several movies in AVI, VOB and MKV container formats, and they could all play, although for some files buffering at the start was pretty long (20 to 30 seconds), and some, but not all, appeared to suffer from audio/video sync issues. MOV videos from my Canon point and shoot camera will buffer as with all other devices I’ve tried (over Wi-Fi). The status bar will automatically hide when playing videos. ED_HD.avi (1080p MPEG-4 – 10Mbps) – The start is OK, but in some scenes where the bitrate must increase a lot, the video is very choppy. hddvd_demo_1080p.mkv (1080p VC1 – 17.5 Mbps) – The video can’t play smoothly most of the time. I’ve also tried with one of my 4K2K video samples: HD.Club-4K-Chimei-inn-60mbps.mp4. At 60Mbps, it’s impossible to play over Wi-Fi, so I copied to the flash, and played it with MX Player. The only problem is that is uses software decode on that file, so I had to revert to using 4K Video Player included with the device, and it played perfectly. 4K VideoPlayer really showcases the power of AllWinner A31 VPU, as you can see your video file lists in thumbnail, and all 15 thumbnails are playing your videos. 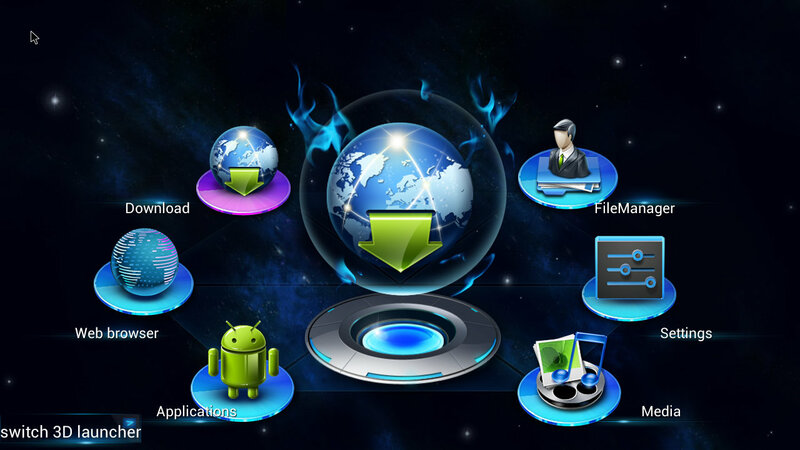 You can also open several videos and arrange them in different windows. I tried with 4, and they all seemed to play simultaneously smoothly. Watch the video below to see what it looks like. It may not be that useful, but I find it’s pretty neat. I’ve installed both Antutu 3.3, and Quadrant, but the latter refused to run. T428 got about 15200 points, and as expected CS868 gets a lower score with 10,559 points. The RK3188 device is almost twice as fast when it comes with RAM, and CPU integer and floating point scores, which is due both because of the difference architecture (Cortex A7 vs Cortex A9), and frequency (1.0 GHz vs 1.6 GHz). The GPU scores are about the same, although I expected A31 to outperform RK3188 in this particular test. The flash write speed seems much better in CS868 compared to T428 (35.8MB/s vs 7.1 MB/s), but I’m not sure how reliable this test is. Quadrant and Antutu system information show the CPU frequency ranges between 120 and 1008 MHz, the screen resolution is 1280×720, there’s a total of 1660 MB RAM available to the system, the rest being probably reserved for the VPU, and about 1200 MB are available. The 16GB NAND flash is partitioned into 2 partitions: a 1GB partition for apps with 746MB available, and a 12.24 GB partition that is basically empty. CS868 looks like a pain to open, so I skipped that part. Luckily, Linuxium did it before me, and we can still have a look inside. The board is fitted with a largish heatsink. On the other side, we’ve got four more RAM chipsets, and flash, as well as what looks like a Realtek Wi-Fi module. There are also 6 pads (LED, 3V3, D-, D+, GND, and WPS), but none of those should be useful for serial access. Maybe it’s now possible to debug using D-/D+ pins (USB), I don’t know. 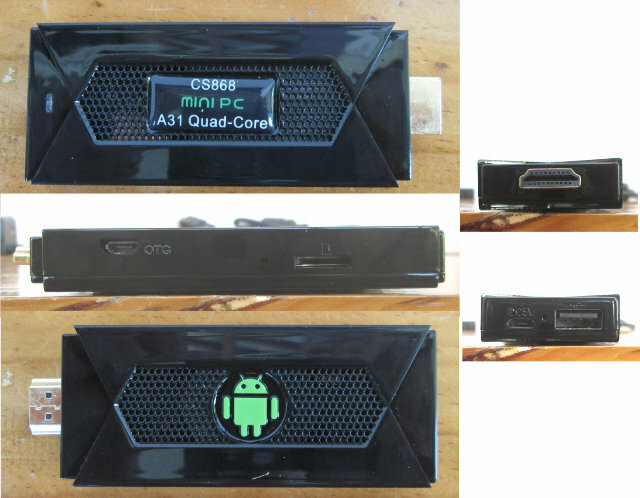 CS868 mini PC has potential, but as it stands the firmware need some improvements, as HDMI audio may cut, and once Wi-Fi failed to initialize. I also had to re-install firmware since the device refused to boot, however I may be partially at fault here, as several times I just disconnected and reconnect power to reboot the device without using the power button first. Performance wise, CPU performance is much slower than RK3188 based devices, and 3D GPU tests appear to be roughly equal according to Antutu, so A31 devices may have to be priced lower than RK3188 to become more interesting. Video playback is where CS868 stands out, it managed almost all files I threw at it, with the only issue being WMA audio, and some long buffering time with a few videos. HDMI pass-though could be a nice feature to have for some. Concerning Linux support, the main advantage of AllWinner A31 devices such as CS868 is that the source code for Linux and U-boot is already available, and this may take a few more months before RK3188 source shows up. However, performance in Linux is likely to be poor for a quad core devices, and GPU acceleration won’t be available due to the PowerVR GPU. Ian Morrison ran a subset of Phoronix Suite tests in a chroot in Android, and found that for some tests results are about the same or even lower than Rockchip RK3066 devices, mostly those relying on single core performance. Does HDMI passthrough (DTS) work? From the article I would say multi channel sound is down mixed to stereo (i.e. unusable). It looks like this is the sore point of all these sticks. If you look at the spec they all say they support AC3 and DTS (HD or not), but it (always?) means that it is down mixed to stereo. And in my book, that means that it isn’t supported. Products based on AMLogic normally get this right. However, I can’t test it as my TV does not support it.